18 3/4 (21, 231/4)" circumference. 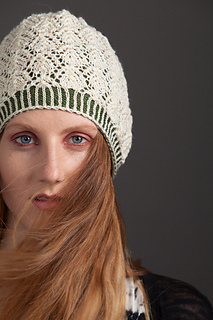 Hat shown measures 21". 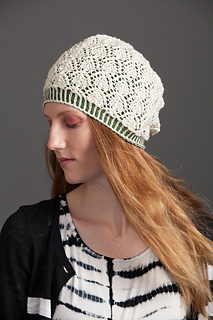 The Frosted Pines Hat has two layers, a stockinette lining and a lace overlay. 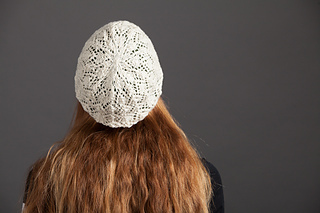 This design uses corrugated ribbing split into two separately worked layers, which are then joined at the crown—see the tutorial for more information. Finished Size 18¾ (21, 23&fradc14;)“ circumference. Hat shown measures 21”. Yarn Spud & Chlöe Fine (80% superwash wool, 20% silk; 248 yd [227 m]/2¼ oz 65 g): #7800 popcorn (MC) and #7818 green bean (CC), 1 ball each. Needles Brim—size 2 (2.75 mm): 16” circular (cir). Body—size 3 (3.25 mm): 16” cir and set of double-pointed (dpn). Adjust needle size if necessary to obtain the correct gauge. Notions Markers (m); smooth contrasting waste yarn; tapestry needle. Gauge 24 sts and 31 rnds = 4” in St st on larger needles.